Best known as a centerpiece of the Silmarillion, J.R.R. Tolkien’s most personal tale has been unwrapped in a new book by Christopher Tolkien, his son. Kyle Willoughby and Claire White have been looking forward to its release for months. 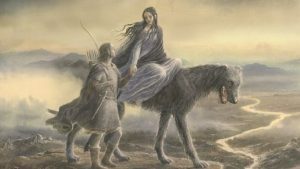 Here to share in this latest gift to fans of high fantasy are Alan Sisto and Shawn Marchese of the Tolkien-dedicated The Prancing Pony Podcast. Together, our hosts and guests discuss the biographical parallels of Beren and Lúthien to the love story of J.R.R. and his wife, Edith, as well as the critical role that Christopher has played in shaping his father’s work and legacy. The show concludes with their thoughts on the book, approaching Tolkien as a newcomer, and a sharing of their favorite passages.